Srinivasa Ramanujan was a largely self-taught pure mathematician. Hindered by poverty and ill-health, his highly original work has considerably enriched number theory. More recently his discoveries have been applied to physics, where his theta function lies at the heart of string theory. 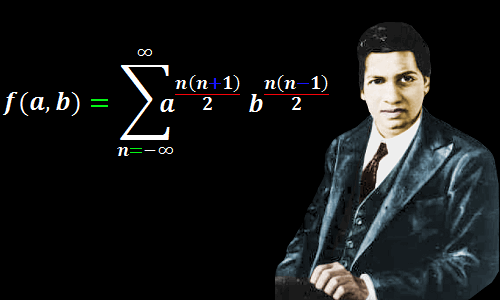 Srinivasa Ramanujan was born on December 22, 1887 in the town of Erode, in Tamil Nadu, in the south east of India. His father was K. Srinivasa Iyengar, an accounting clerk for a clothing merchant. His mother was Komalatammal, who earned a small amount of money each month as a singer at the local temple. His family were Brahmins, the Hindu caste of priests and scholars. His mother ensured the boy was in tune with Brahmin traditions and culture. Although his family were high caste, they were very poor. Ramanujan’s parents moved around a lot, and he attended a variety of different elementary schools. At age 10, Ramanujan was the top student in his district and he started high school at the Kumbakonam Town High School. Looking at the mathematics books in his school’s library, he quickly found his vocation. By age 12, he had begun serious self-study of mathematics, working through cubic equations and arithmetic and geometric series. He invented his own method of solving quartic equations. As Ramanujan’s mathematical knowledge developed, his main source of inspiration and expertise became Synopsis of elementary results in pure mathematics by George S. Carr. This book presented a very large number of mathematical results – over 4000 theorems – but generally showed little working, cramming into its pages as many results as possible. With little other guidance, Ramanujan came to believe this was how mathematics was done, so he himself learned to show little working. Also, he could afford only a small amount of paper, doing most of his work on slate with chalk, transferring a minimal amount of his working and his results to paper. His memory for mathematical formulas and constants seems to have been boundless: he amazed classmates with his ability to recite the values of irrational numbers like π, e, and √2 to as many decimal places as they asked for. In 1904, Ramanujan left high school; his future looked promising: he had won the school’s mathematics prize and, more importantly, a scholarship allowing him to study at the Government Arts College in the town of Kumbakonam. Obsessed with mathematics, Ramanujan failed his non-mathematical exams and lost his scholarship. In 1905, he traveled to Madras and enrolled at Pachaiyappa’s College, but again failed his non-mathematical exams. At the beginning of 1907, at age 19, with minimal funds and a stomach all too often groaning with hunger, Ramanujan continued on the path he had chosen: total devotion to mathematics. The mathematics he was doing was highly original and very advanced. Even though (or some might say because) he had very little formal mathematical education he was able to discover new theorems. He also independently discovered results originally discovered by some of the greatest mathematicians in history, such as Carl Friedrich Gauss and Leonhard Euler. Ill-health was Ramanujan’s constant companion – as it would be for much of his short life. By 1910, he realized he must find work to stay alive. In the city of Madras he found some students who needed mathematics tutoring and he also walked around the city offering to do accounting work for businesses. And then a piece of luck came his way. Ramanujan tried to find work at the government revenue department, and there he met an official whose name was Ramaswamy Aiyer. Ramanujan did not have a resume to show Ramaswamy Aiyer; all he had were his notebooks – the results of his mathematical work. Ramanujan’s good fortune was that Ramaswamy Aiyer was a mathematician. He had only recently founded the Indian Mathematical Society, and his jaw dropped when he saw Ramanujan’s work. Ramaswamy Aiyer contacted the secretary of the Indian Mathematical Society, R. Ramachandra Rao, suggesting he provide financial support for Ramanujan. At first Rao resisted the idea, believing Ramanujan was simply copying the work of earlier great mathematicians. A meeting with Ramanujan, however, convinced Rao that he was dealing with a genuine mathematical genius. He agreed to provide support for Ramanujan, and Ramaswamy Aiyer began publishing Ramanujan’s work in the Journal of the Indian Mathematical Society. Ramanujan’s work, however, was hard to understand. The style he had adopted as a schoolboy, after digesting George S. Carr’s book, contributed to the problem. His mathematics often left too few clues to allow anyone who wasn’t also a mathematical genius to see how he obtained his results. In March 1912, his financial position improved when he got a job as an accounting clerk with the Madras Port Trust. There he was encouraged to do mathematics at work after finishing his daily tasks by the port’s Chief Accountant, S. Narayana Iyer, who was treasurer of the Indian Mathematical Society, and by Sir Francis Spring, an engineer, who was Chairman of the Madras Port Trust. Francis Spring began pressing for Ramanujan’s mathematical work to be supported by the government and for him to be appointed to a research position at one of the great British universities. A Crank or a Genius? Ramanujan and his supporters contacted a number of British professors, but only one was receptive – an eminent pure mathematician at the University of Cambridge – Godfrey Harold Hardy, known to everyone as G. H. Hardy, who received a letter from Ramanujan in January 1913. By this time, Ramanujan had reached the age of 25. Professor Hardy puzzled over the nine pages of mathematical notes Ramanujan had sent. They seemed rather incredible. Could it be that one of his colleagues was playing a trick on him? Hardy was eager for Ramanujan to move to Cambridge, but in accordance with his Brahmin beliefs, Ramanujan refused to travel overseas. Instead, an arrangement was made to fund two years of work at the University of Madras. During this time, Ramanujan’s mother had a dream in which the goddess Namagiri told her she should give her son permission to go to Cambridge, and this she did. Her decision led to several very heated quarrels with other devout family members. 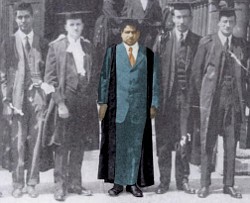 Ramanujan arrived in Cambridge in April 1914, three months before the outbreak of World War 1. Within days he had begun work with Hardy and Littlewood. Two years later, he was awarded the equivalent of a Ph.D. for his work – a mere formality. Ramanujan’s prodigious mathematical output amazed Hardy and Littlewood. The notebooks he brought from India were filled with thousands of identities, equations, and theorems he discovered for himself in the years 1903 – 1914. Some had been discovered by earlier mathematicians; some, through inexperience, were mistaken; many were entirely new. Ramanujan had very little formal training in mathematics, and indeed large areas of mathematics were unknown to him. Yet in the areas familiar to him and in which he enjoyed working, his output of new results was phenomenal. Ramanujan said the Hindu goddess Namagiri – who had appeared in his mother’s dream telling her to allow him to go to Cambridge – had appeared in one of his own dreams. It is possible that Ramanujan’s brain was wired differently from most mathematicians. He seems to have had a personal window through which some problems in number theory appeared with a clarity denied to most people in the field. Results they fought for through days of arduous thought seemed obvious to Ramanujan. Given that David Hilbert is regarded by many as the greatest mathematician of the early twentieth century, and Hardy and Littlewood were immensely influential mathematicians, it is fascinating to see how exceptional Hardy thought Ramanujan’s raw mathematical ability was. In his short lifetime he produced almost 4000 proofs, identities, conjectures, and equations in pure mathematics. His theta function lies at the heart of string theory in physics. In July 1909, Ramanujan married S. Janaki Ammal, who was then just 10 years old. The marriage had been arranged by Ramanujan’s mother. The couple began sharing a home in 1912. When Ramanujan left to study at the University of Cambridge, his wife moved in with Ramanujan’s parents. Ramanujan’s scholarship was sufficient for his needs in Cambridge and the family’s needs in Kumbakonam. For his first three years in Cambridge, Ramanujan was very happy. His health, however, had always been rather poor. The winter weather in England, much colder than anything he had ever imagined, made him ill for a time. In 1917, he was diagnosed with tuberculosis and worryingly low vitamin levels. He spent months being cared for in sanitariums and nursing homes. In February 1919, his health seemed to have recovered sufficiently for him to return to India, but sadly he lived for only one more year. Srinivasa Ramanujan died aged 32 in Madras on April 26, 1920. His death was most likely caused by hepatic amoebiasis caused by liver parasites common in Madras. His body was cremated. Sadly, some of Ramanujan’s Brahmin relatives refused to attend his funeral because he had traveled overseas. "Srinivasa Ramanujan." Famous Scientists. famousscientists.org. 28 Oct. 2015. Web. Image of Paul Erdős by Topsy Kretts, Creative Commons Attribution 3.0 Unported License. Image of Michio Kaku by Campus Party Brasil, Creative Commons Attribution-Share Alike 2.0 Generic License. A Review of Bruce C. Berndt’s Ramanujan’s Notebooks, Parts I – V.